Ideal combination! A nice studio with many amenities of a holiday close! The studio is fully equipped and you have free access to all the amenities of this lovely park. A large communal pool, a tennis court, a volleyball court, a playground and a bowling alley. It has not feel like cooking you can visit in the cozy restaurant and bar. The setting is beautiful! Numerous picturesque villages and within walking distance of the beautiful beach Algajola, between Calvi (12 km) and Ile Rousse (7 km). The location is ideal for a beach holiday with the whole gezin.De studio is spacious, air conditioned and well maintained. 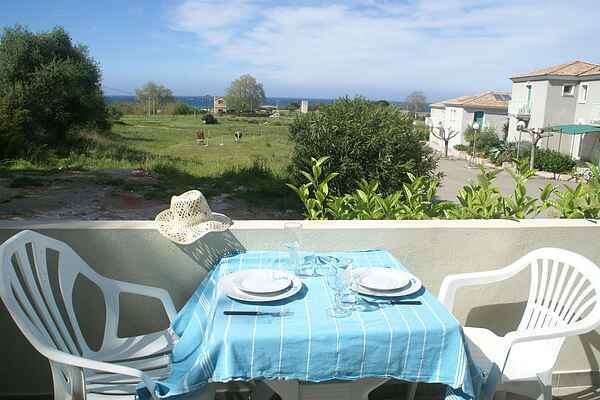 From your terrace you can even see the azure sea at the beach of Algajola.